You see them everyday and everywhere: appliances! Find great appliance repair courses below and start your vocational career training today. These are wonderful gadgets that we have not been able to live without since the dawn of electricity. If you love to play with gadgets and have a desire to know how they work or how they are put together, turn your interest into a career today by taking Appliance Repair Courses. Appliance repair technicians are in high demand as washers, dryers and even air conditioners constantly need upkeep and repair. The training for this interesting field is light; most training taking only a few weeks or months which is a distinct advantage over degreed careers that take years. Once you get into this field of work, you will find there is always something new to learn or a new gadget to explore. Luckily finding appliance repair courses is relatively easy and they can be found in most any town and online. Check your local community college or trade schools and see what they have to offer. When looking into appliance repair courses, you will first need to narrow your search down to the types of appliances you are most interested in. There are many different types of appliances out there such as washers, dryers, toasters, DVD players and even air conditioning units. 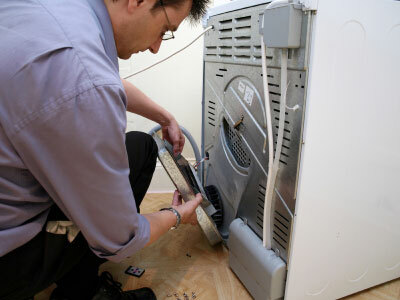 Generally appliance repair is split into categories making it easier to find appliance repair courses that best fit you. These categories are small appliances, large appliances and HVAC (heating and cooling units). When looking into appliance repair courses, check on the type of certificate you will be given and if any special licensure is needed beyond your education. There are some cases where special licensure and certification is needed, such as refrigeration repair which is EPA mandated due to the handling of Freon and other chemicals. One thing to note is that while you can enter this field with relatively little knowledge or training, it's problematic. A lack of education can cause problems for you and make customers unhappy with unskilled labor. Formal training with appliance repair courses will make you much more in demand and give you confidence that you can get the job done properly. Many schools and course studies for appliance repair offer certification which will only add to your resume, putting you ahead of the rest when looking for employment. Once you have graduated from your course of study for appliance repair, you will find a number of opportunities awaiting you, from working with major companies to local service providers. You can even become your own boss! Imaging working on your terms and setting your own schedule. So get started today with appliance repair courses and work your way into your own appliance repair business. When looking for an appliance school you need to make sure they are teaching you about topics that will help you in your career. Many appliance school training programs focus just on appliance repair where as some might even go into HVAC techniques. Many of the programs you will find 100% online. Be sure that when you are researching the school to find out if they are 100% vs campus or some might have a combination where you do your hands-on training in a classroom setting and then do different modules online. Either way we know you’ll find the right school. Another thing to research is their accreditation. We recommend only taking a course from a fully accredited school. This protects you as a student in the event the school goes out of business or if you are transferring over from another school. Make sure you research their tuition costs in full including any supplemental fees they might charge and finally research all of your financial assistance options. Many schools offer Title IV funding and Pell Grants where others might have their own payment plans they offer, many with zero interest payment options.